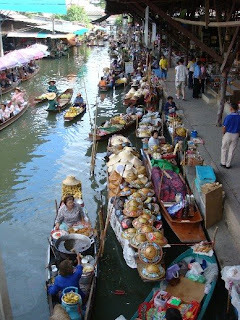 Many visitors who visited Bangkok have probably been to the famous Damnoen Saduak floating market. It is actually located in a neighbouring province of Bangkok called Samut Songkhran. It took me about 90 minutes on car to reach Damnoen Saduak on a Saturday. For those visitors who don’t have a car, they can either join one of the one day trips from Bangkok or take a bus. Damnoen Saduak is very touristy. I went there on a Saturday and it was packed with tourists, both local and foreign. But this is one of those unique experience that makes Bangkok famous. Even the reality tv show ‘American Next Top Model’ did a photo shoots of the models here! First thing I did was to get some breakfast. I sat on one of the concrete steps near a noodle vendor who sells on a boat. Whie my friends and I were waiting for our noodles, we bought some local snack to try. When the noodle was ready, the lady handed me my bowl of noodle soup and I enjoyed it the local way on the step, by the canal. After we finished our noodles, we rented a long tail boat and on our way to tour and shop at floating market! One of the options was long tail boat with motor which would go faster. Another option was the slow boat that had to be manually rowed by a person. We went for the second option. There were colourful straw hats for us on the boat as the sun was scorching hot! On both sides of the canal were all kinds of souvenir aimed at tourists. It was almost like Chatucak Market has been moved to a canal. Nothing really interested me as they are not that unique. However, what I thought more interesting were perhaps tropical fruits sold on boats. They looked so colourful and fresh. At almost the end of the trip, we were stuck in a ‘floating traffic jam’!! I couldn’t believe it was so crowded that we were actually inching slowly for about 30 minutes! The whole trip took about 90 minutes and I felt relieved when I got back to the pier. This is the place that I would only come once just as the ‘thing-to-do.’ Otherwise, personally, I think there are more interesting things to do or places to shop in Bangkok than this. 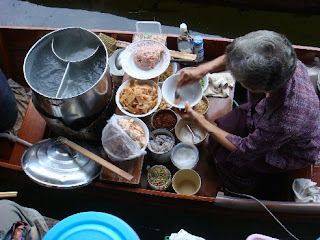 Nevertheless, when I look at my photos from Damnoen Saduak Floating Market, it was definitely very ‘Bangkok’. It was self-explanatory that it is Bangkok (although it is NOT in Bangkok)! its like "watching" another version of discovery channel when reading your blogs..... very insightful of the happenings in Siam.